We at Twin Cities Geek are excited to have a presence at CONvergence 2016! We have a few things going on, including some cool swag, a fan table, and two panels. We hope that if you are attending CONvergence this weekend, you take some time to connect with Twin Cities Geek! Stop by and say hello! Twin Cities Geek will have a fan table in CONvergence Central, right outside MainStage. Pay us a visit to get your picture taken with one of our word balloons and be featured on our Facebook page! Show us at our fan table that you follow @TwinCitiesGeeks on Twitter or like Twin Cities Geek on Facebook and get your very own Twin Cities Geek button! 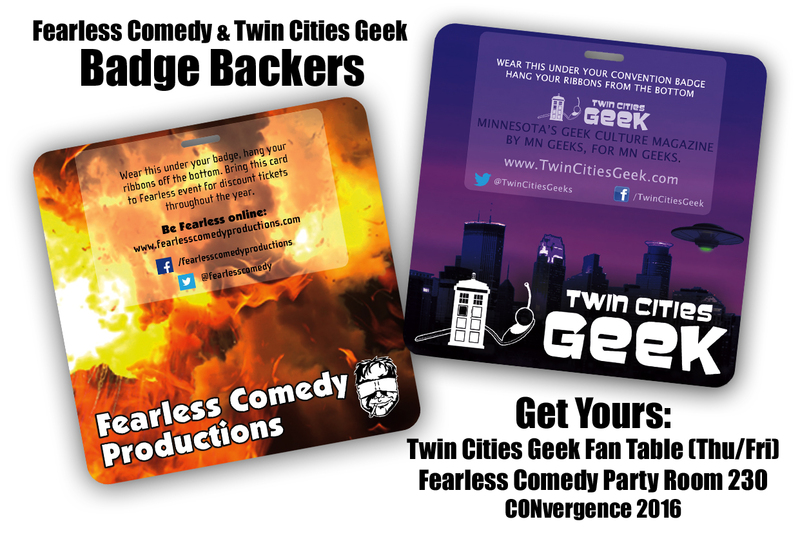 We have teamed up with our friends at Fearless Comedy Productions to bring you these sweet double-sided badge backers. They are the perfect size to add some flair to your convention badge and hang all your badge ribbons from the bottom! One side features Twin Cities Geek and the other side features Fearless Comedy Productions, so you can choose whether you want to celebrate your Minnesota geekery or your love of geek-flavored comedy. Hang on to the badge backer after the convention and bring it to Fearless Comedy Productions shows throughout the year to get discounted tickets, too! The Twin Cities Geek umbrella has two panels at CONvergence 2016, and we would love for you to check them out! One panel is all about TwinCitiesGeek.com, the online magazine you are reading right now, and the other brings the moderators of our large Facebook discussion group together to have a talk about community management. Saturday, July 2, 5:00 p.m.–6:00 p.m.
TwinCitiesGeek.com is made by Minnesota geeks, for Minnesota geeks. Learn how it came about, and the effect that boosting the diverse gamut of voices in the community has on the community. Sunday, July 3, 12:30–1:30 p.m. Spend an hour with the admins of the “Twin Cities Geeks” Facebook group and learn all about the goals, challenges, mistakes, and rewards unique to running a large, diverse internet community of Minnesota geeks. CONvergence is an annual convention for fans of science fiction and fantasy in all media: a four-day event with more than 6,000 members, and the premiere event of its kind in the Upper Midwest. CONvergence 2016 will take place June 30–July 3, 2016, in Bloomington, Minnesota. Visit CONvergence-con.org to register or learn more about the convention.